Sit more than 4 hours a day at an array of monitors? 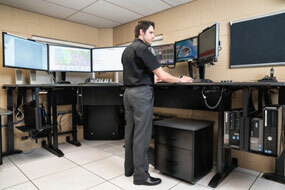 Our professional grade, ergonomic workstations are designed for demanding medical and non-medical applications. Radiologists and Cardiologists spend significant portions of their day sitting at their PACS, performing repetitive tasks, in a poorly light room. 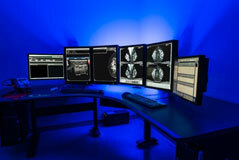 Our tailor-made workstations for imaging professionals reduce the risk that can arise from this environment. Facilitating sitting and standing throughout the day. Optimizing monitor height and distance to reduce visual fatigue. Providing a clutter free environment. Telemetry monitoring staff spend long hours performing a life-critical service. Provide an environment that enhances their role. Many of the monitoring technicians, who work 12-hour shifts, complained about neck and back soreness and stiffness and swollen feet because they were sitting for so long, or had to move in awkward or inefficient ways to accomplish their daily responsibilities. 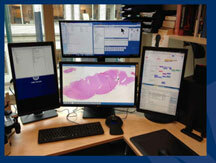 The shift to digital pathology will require pathologists to create flexible and stable ergonomic workspaces that accommodate both a digital workstation and a microscope. Mission critical, technically complex, physically demanding. 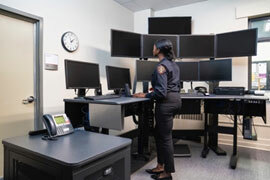 These challenges must be addressed when integrating ergonomic concepts into a dispatch center.